Journey through psychedelic worlds in 2016. 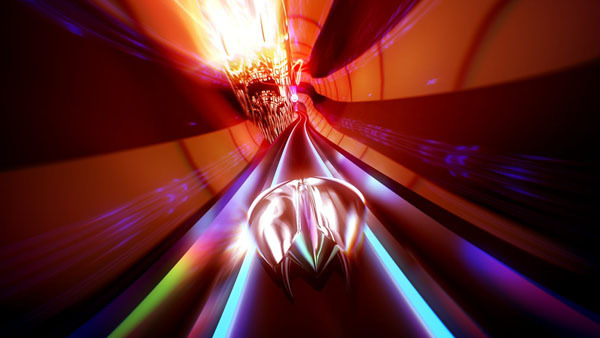 Indie developer Drool have announced Thumper, a “rhythm violence” game, will make its console debut on PlayStation 4 in 2016. The game sees players control a “space beetle” as it hurdles through “treacherous and psychedelic worlds” with the analog stick and a single button. By keeping the gameplay pure and simple, we combine classic rhythm-action with speed and satisfying physicality. The basic move set of thumping, sliding, and turning is easy to learn. But as you careen onward, you’ll need to master new moves and survive adrenalizing boss encounters. To reach synesthetic bliss, you must go through rhythm hell. And nothing can prepare you for the ultimate confrontation with an insane giant head from the future: CRAKHED.